HairPen Bend, my entry for the IBM student Cell BE competition, is now done and dusted! HairPen Bend is the end result of my research into hair simulation this year. 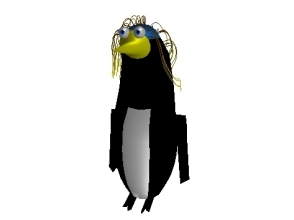 The above screenshot is of "Beryl the long-haired penguin", the heroine of my entry into IBM's student Cell BE competition. Although I ran out of time on the project in the end, the results are fairly good. I'm hoping to publish a paper on them in due course. MapEditor was my third-year undergraduate project at Oxford. 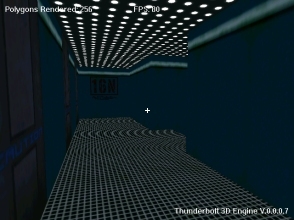 Based on Valve's Worldcraft (now Hammer) editor, it allows the editing of 3D worlds. In addition to supporting similar "indoor" editing features to Worldcraft, it also allows users to edit spline-based outdoor landscapes, as can be seen in the screenshot above. MapEditor is a free download and can be obtained from here. Never Say Die was a BSP-based 3D engine I wrote in 2002-3. 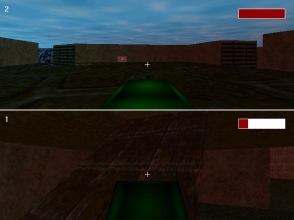 Mostly notable for its loading and rendering of animated Quake 2 models, the game won a school innovation award in 2002. 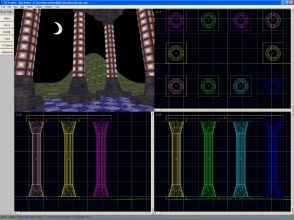 Written in 2001, Nightwalker was the first game I wrote which used BSP and PVS technology. I eventually stopped working on it when I started on Never Say Die. The sequel to one of my older games, Tank Zone™, TZ2 was my first foray into 3D. It allowed both deathmatch and capture-the-flag games to be played over a network. Paradox II was the sequel to an old 2D platform game I wrote for DOS. The original storyline saw the hero (you) running around with lots of weapons trying to kill the evil terrorists who were trying to take over the planet. The new game built on the success of the original Paradox™ and added a huge variety of new features, including lifts, teleports and more intelligent AI. Welcome to GX Studios NET! GX Studios started life as a school game development outfit at MTS Northwood in 1998. I initially started it as my own "company", back in the days when that seemed like a fun thing to do. 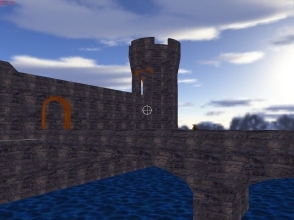 Since going up to Oxford in 2003, I haven't had as much time to devote specifically to games, but I've continued working on computer graphics applications. I am currently pursuing a doctorate in computer science and looking to move into the medical applications field. In particular, I want to write a decision support system for kidney cancer.